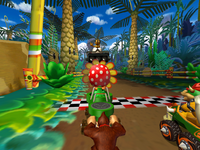 The Piranha Pipes make up Petey Piranha's unlockable kart in Mario Kart: Double Dash!!. It can be unlocked by completing the Star Cup in Mirror Mode. The kart is composed of two Warp Pipes stuck together, keeping in tradition with Piranha Plants' past roles: arising from pipes. Based on in-game stats, the Piranha Pipes has the same speed and acceleration as the DK Jumbo. However, its weight is tied with that of the Koopa King and Boo Pipes, making it one of the heaviest karts in the game. The Piranha Pipes's acceleration is equal to that of the DK Jumbo. As for the Piranha Pipes's top speed, it is also tied with that of the DK Jumbo as well as the Barrel Train and Bullet Blaster. The Piranha Pipes, Boo Pipes and the Barrel Train are tied for being the least bouncy when making jumps, and this kart is also tied with the Boo Pipes and the Wario Car for being the thinnest heavyweight kart. Lastly, although the Piranha Pipes is a heavyweight kart, it has one of the better off-road statistics in the game; its off-road speed is tied with that of the Barrel Train, and its off-road speed is the second best of all heavyweight karts, losing only to the Boo Pipes. 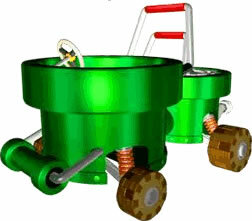 This kart also reappeared in Mario Super Sluggers in the minigame Piranha Panic, being ridden by Piranha Plants that the player needs to hit by throwing baseballs at them. Furawā dokkan Flower "Paboom", dokkan is a word play on dokan, meaning "pipe" and "Kaboom!". The Piranha Pipes, Boo Pipes, Heart Coach, and Bloom Coach all share the same engine sound. The Piranha Pipes makes the exact same horn sound as the Wiggler Wagon. This page was last edited on June 11, 2018, at 12:31.